This beautiful and flavorful recipe is from Chef Barret Beyer of Hell's Kitchen's current season on Fox TV, Tuesday nights at 8 PM. The tender pork is topped with a mixture of gently sauteed mushrooms and spinach flecked with pine nuts. 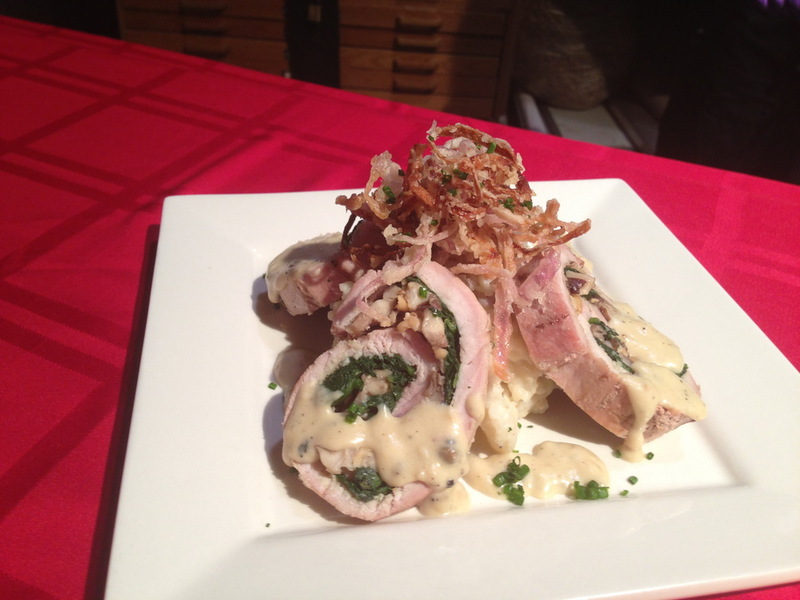 It is rolled, baked, sliced and served over smashed potatoes bright with roasted garlic. The piece de resistance is the sauce, rich with heavy cream and Jack Daniels. We are most definitely ready for dinner! The complete recipe will appear in the Savoring the Shore fundraising cookbook to benefit Sandy relief. Chefs and home cooks, please join Chef Barret in submitting your recipe using the form on this site or by simply emailing to savoringtheshore@gmail.com. Thank you in advance for participating! April 16, 2013 by Cheryl Larkin.